We were delighted to welcome Mr. Weeks’ 3B class from the Pioneer Valley Chinese Immersion School today. They were awesome and we had a lot of fun exploring archaeological excavation and artifact processing with them. I would also like to give a huge shout out to Stephani, Eileen and Jamie who kindly volunteered their time to work with me in the lab. They did an outstanding job cleaning and documenting samples, and we really appreciate their hard work and enthusiasm. Of the many interesting discoveries made today, the two that stand out to me are the cow mandible (jawbone) uncovered by Maxine and the base of a medicine bottle excavated by Linda. The mandible is from the right side of a cow’s jaw. A similar mandible fragment was discovered yesterday and that one, too, is from the right side of a cow. This indicates that we have the remains of at least two separate cows in our assemblage. The photo in yesterday’s blog showed a jawbone in situ in the ground. Here you can see today’s mandible discovery after cleaning in the lab. The medicine bottle base excavated by Linda is interesting because it is from a local Northampton manufacturer. 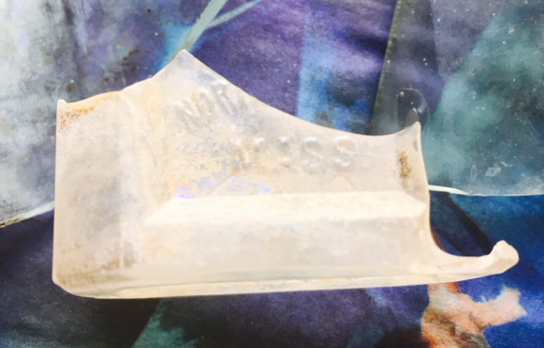 The letters “NOR” and “MASS” were molded as a raised inscription and are clearly visible on the side of the bottle. 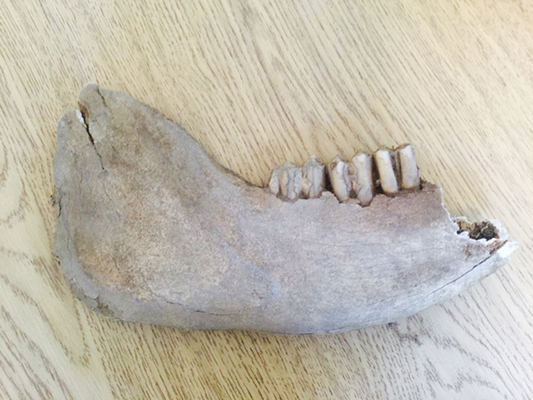 Another cow jawbone discovered at the site. Isn’t it amazing what a little cleaning can do?